Join the Harbor Ring in our Rally for a Bicycle/Pedestrian Path over the Verrazano Bridge Two weeks left until the Harbor Ring rally! We’re 3,700 strong–and growing! Throughout Staten Island, Brooklyn, New York City, and the United States, people everywhere are declaring their support for a walkable, bikeable path on the Verrazano-Narrows Bridge. 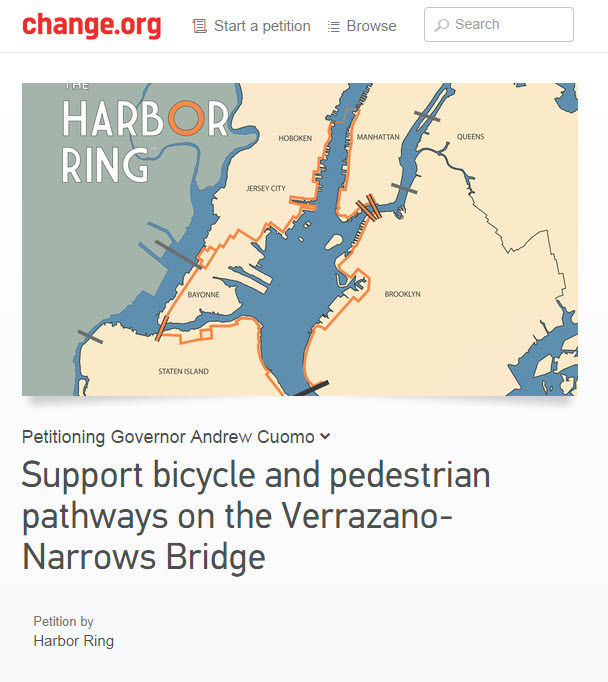 Sign here to support bicycle and pedestrian pathways on the Verrazano-Narrows Bridge today! We need a pedestrian/bicycle pathway across the Verrazano Narrows Bridge so that Staten Island can finally be truly connected to the main land without paying a toll.